The CRep Opto two-channel isolated CAN Bus repeater transmits and amplifies CAN signals using optical isolation, transparently to the CAN protocol. CRep N allows the design of flexible wiring topologies, with star and tree structures and stub lines easily realized. When a CRep Opto repeater is used, the effect of the propagation delay through the repeater must be included in the cable length calculation. For a CRep Opto repeater, the typical and maximum propagation delays is 125ns and 200ns, respectively. Assuming a 5.5ns/m propagation delay for cable, the maximum propagation delay through the CRep N repeater is equivalent to a cable length of roughly 36m. 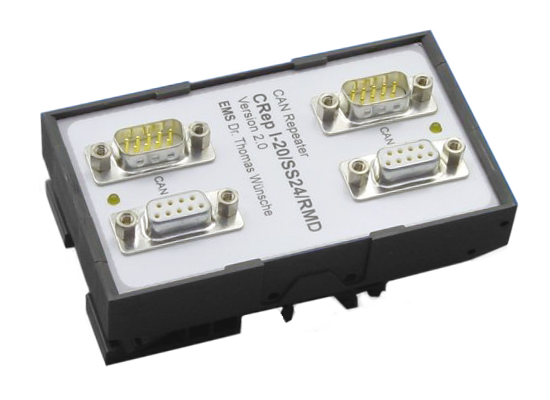 CRep Opto devices include 2 CAN segments fed to a male and a female plug of type D-Sub 9. The plugs carry the CAN signals and the supply voltage. The following table shows the function of the internally connected CAN interface. Any (also temporary) stress in excess of the limiting values may cause permanent damage on CRep N and other connected devices. Exposure to limiting conditions for extended periods may affect the reliability and shorten the life cycle of the device.